You might have seen keirin at the Olympics – the event where cyclists ride round behind a motorbike. 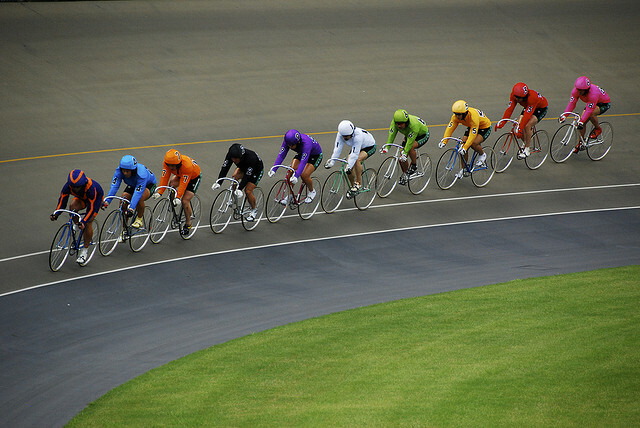 But did you know that keirin comes from Japan, where it’s a hugely popular spectator sport? There are 47 velodromes across the country, but keirin in Japan is a world away from the glitz and glamour of the Olympic Games. In its homeland, keirin is all about gambling. It’s one of only five sports that it’s legal to bet on. (The others are motorbike racing, horse racing, powerboat racing and football.) It was begun in 1948, mainly so the government could make money by taxing it, and it’s become a huge earner: over ¥1.5 trillion is bet on keirin every year. The punters are almost exclusively older men – from middle age and up. Out of thousands of people at a stadium, expect to see only a handful of women. The rules are keirin are quite simple. Nine riders start in a line, side-by-side, a few metres behind another cyclist on a pacer. (In the Olympics the pacer uses a motorbike, but in Japan it’s just another bicycle.) The race gets off to a slow start, as the pacer only rides at about 25km/h. The racers jostle for position, but all end up in a line behind the pacer. Then nothing much happens for the next few laps, except that the pacer gradually brings his speed up to about 50km/h. The races are usually 2km long, but it’s not until about 600 metres from the end when the pacer leaves the track that the race begins in earnest. The orderly line transforms into a mad scramble for position, and collisions and dramatic crashes are not uncommon. As the riders sprint for the finish, the pace picks up to around 70km/h. 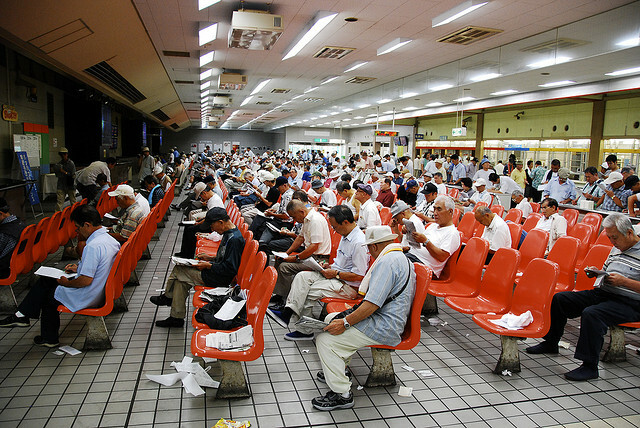 The betting hall at Omiya Velodrome, where many of the spectators spend most of the day. You might think that cycling is all about who can pedal the fastest, but tactics play a big part in keirin. It’s not obvious unless you know what you’re looking for, but the riders work in teams, usually supporting other competitors from the same part of Japan. Younger riders are usually expected to ride in front, so that their teammates can ride in their slipstream. This system gives an advantage to older racers, allowing them to remain competitive into their forties and fifties. Before the race begins, each rider declares his strategy – whether he will ride at the front, or stay behind and make a late sprint. 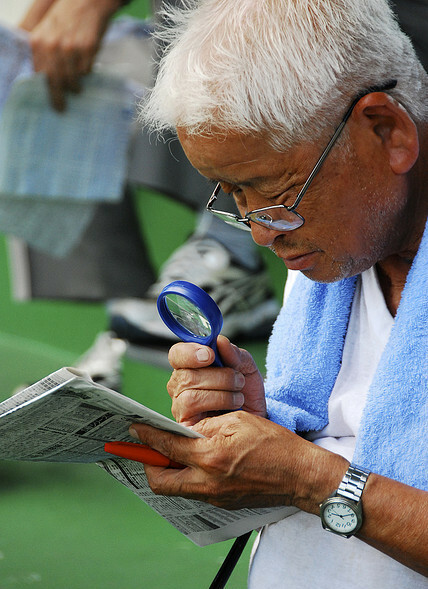 This allows the punters to make more informed choices when they place their bets – although strategies often have to change as the race develops. All in all, keirin has been designed to be unpredictable – if the fastest rider always won, there wouldn’t be much point in placing bets. The velodromes sit around twenty to thirty thousand people, but if you visit one, you’re likely to find it curiously empty. That’s not because no one’s watching, but because most punters prefer to watch via TV screens in betting shops across the country. Even those people who attend in person sometimes watch the races from screens in the betting hall, rather than heading outside. Race meets usually take place over three days, each velodrome hosting around twenty events a year. There are eleven races each day, and every rider takes part in one of them, proceeding to a higher ranked race if he wins, a lower one if he loses. Races keep going come rain or shine, though the riders get bonus pay for competing in wet weather, and two of the velodromes are indoors. All of the riders are professionals, and they generally make a good living out of their prize money. The top earner can make more that ¥150 million in a year. If a rider performs poorly, and stays at the bottom of the ranking for too long, he’s forced to retire. Being a keirin rider is highly prestigious, and only around 10% of applicants to the keirin school are successful. But it’s once they’ve got into the school that things get really tough. The school is run like a boot camp, and trainees have to complete eleven months of gruelling training before they’re allowed to begin racing. Each day starts with a roll call at 6:45am, followed by exercises, running, and then cleaning duties. After a half-hour break for breakfast, they do hill climbing and lap training, before an hour’s break for lunch. Then there’s an hour and a half of classroom work on rules, tactics and training theory. Finally, they do indoor exercises on stationary bikes, then actual race training on a velodrome, before finishing at 5pm. They then get a few hours to eat dinner and relax, before lights-out at 10pm. You might think no one would put up with this kind of treatment, but the steady stream of applicants shows just how much people want to become professional racers. Many of the students are athletes who have transferred from other sports, often in their thirties. Women competed in keirin from 1949 until the sport became men-only in 1964. They were only readmitted in 2012, and now compete in a separate series of races at some of the same meets as their male colleagues. Recently a handful of elite international riders have been invited to join the Japanese keirin circuit, for a season or two at a time. They have to complete a one and a half week course at the keirin school, but under much softer conditions than their Japanese counterparts. 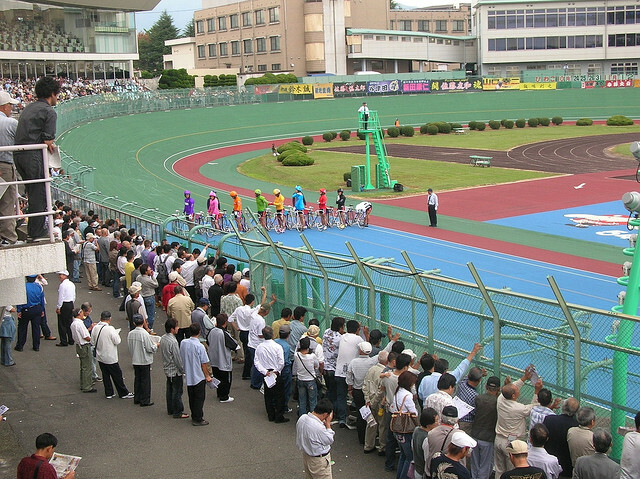 If you’re not a big gambler, keirin is a very cheap form of entertainment – entry to a velodromes only costs around ¥100. You can find out about the locations of velodromes and the times of meets on the official keirin website. Besides the fun of the races and the betting, keirin gives you a glimpse into working class Japanese culture – something you’ll not learn much about by reading guidebooks or going sightseeing. The atmosphere is relaxed and friendly, so don’t be worried about being perhaps the only foreigner of the only woman in attendance. Give it a go and you might just find you really like it.